For 2019, the Dodge Journey SXT is dropped from the lineup, while a new 4-cylinder only SE Value Package trim makes its entry. New standard features on the SE trim includes fog lights and LED tail lights, altered front and rear fascias, folding and heated door mirrors, and three-zone air conditioning. The V6 is now an option on SE FWD models, while a Blacktop Appearance Package with optional new 19-inch Gloss Black wheels is available on all SE models. 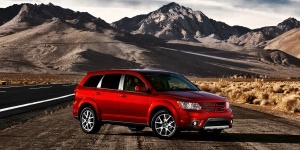 Get the best price for the Dodge Journey of your choice from a dealer in your area. Request a price quote now.